Product prices and availability are accurate as of 2019-04-22 14:13:25 UTC and are subject to change. Any price and availability information displayed on http://www.amazon.com/ at the time of purchase will apply to the purchase of this product. HG6008 Size: 6' x 8' Features: -Crystal clear SnapGlas polycarbonate panels are virtually unbreakable.-Heavy-duty, corrosion resistant aluminum frame.-Unique, split-style door provides easy access and ventilation.-Nearly 50 sq.ft of usable interior space & 6'-8 of headroom.-Safe. 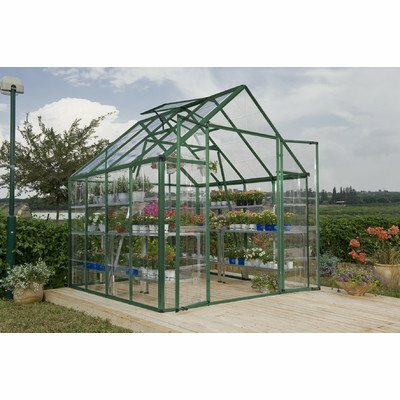 No dangerous glass to break.-Great for growing in all climates. Includes: -Includes preassembled door & window with weatherstripping.-Galvanized steel base kit with spike hold-downs included. Assembly Instructions: -Fast & easy assembly using SmartLock connectors.